History buff and comedian Dave Anthony was considering starting a new podcast in 2014. His idea was to write up an unknown story from American history and read it to a different comedian each week. Having not heard of the story before, Dave hoped the comedian’s reaction would be hilarious. He gave it a go and his first guest was comedian Gareth Reynolds. They immediately clicked and fans flooded social media telling Dave to never change the co-host. And he didn’t. Sticking to the formula of Dave reading Gareth a story he has never heard, The Dollop quickly shot up the charts. Fans of both comedy and history were drawn to the wild stories and quick improv skills of Gareth. 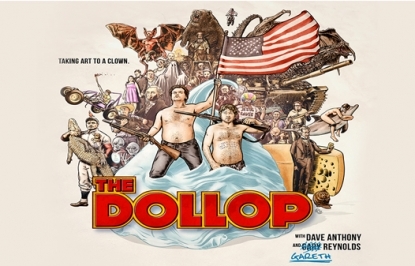 With millions of downloads, The Dollop has become a regular presence on top of the podcast charts, as well as selling out shows in both the US and Australia.